SHOWS: TUBIZE, BELGIUM (MARCH 20, 2019) (REUTERS - ACCESS ALL) 1. BELGIAN TEAM WARMING UP 2 .BELGIAN SOCCER TEAM COACH, ROBERTO MARTINEZ, TALKING WITH AN ASSISTANT 3. 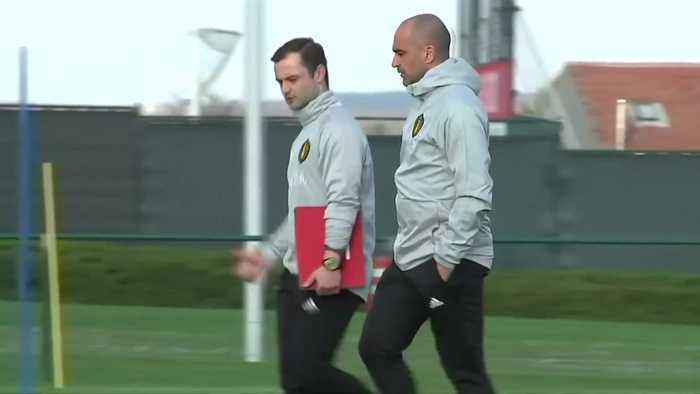 SOUNDBITE (English) BELGIAN TEAM COACH ROBERTO MARTINEZ SAYING: "If you look at Russia, they don't really need to have the ball to hurt you and I think it is a team that they know to take the game into what they want. They are outstanding in their attacking transition. They are a team that create threats very quickly, they get the ball very quick in your own box. I think that it is something we have to deal with a lot and I think it's them to ask to have a very high tempo and to move the ball very quickly to stop Russian threat. But it is true that even in games that Russia outpower the opposition they don't necessarily need to have the control of the ball." STORY: Belgium and Russia start their respective 2020 UEFA European Championship campaigns this week at the King Baudouin Stadium in Brussels. The Belgians are currently at the top of the FIFA world rankings, and will also face Scotland, Cyprus, Kazakhstan and San Marino in their qualifying group. Despite their high ranking, Belgium were humbled in their last outing, losing 5-2 to Switzerland in the UEFA Nations League, and they will have to face Russia without star striker Romelu Lukaku, who has been ruled out with a foot injury. Russia are expected to provide Belgium's toughest test in Group I, after their successful World Cup campaign on home soil last summer.